Jon says: Occasionally, a game comes along that will forcibly remind you that mechanics, graphics, and controls have nothing to do with direct, narrative storytelling. Papers, Please was one of those games. While it deftly utilized the strengths of the videogame as a form to present a branching, multifaceted story that was deeper than it immediately appeared. That story was an intensely personal one in a game all about alienation and disconnection from other people. At the same time, the game constantly bombarded you with micronarratives in the form of all the people seeking entry into Arztotska. Every one of them had a story, and deciding whether or not to help a few rebels, or a woman who wanted to meet her grandson, across the border was rough - especially when you had to weigh their own narratives against your own family's needs. Something about the oddly addictive gameplay, the pervasive grey coloring of it all, and the pride you get from slowly building up your skill at checking for errors and scanning bodies. It is an experience altogether unlike anything you've done in a game before. It is, meanwhile, fantastically simple and wholly quotidian. If you are interested in where games stretch the boundaries of what they can do, and in where they execute very specific ideas from the minds of auteur designers, Papers, Please was the cannot miss game from this year. Heather says: It's 1995 and you've returned to your family home from a trip abroad. Your old, creepy, mega-mansion-in-the-Northwestern-forests family home. That's essentially all the information you're given as you begin exploring the world of Gone Home and it's just enough to propel you through the house in search of your family's whereabouts and any other secrets you pick up along the way. Developed by the four person team at The Fullbright Company, Gone Home is a story-exploration game that places an emphasis on discovering the details. In order to put together the details of your missing family, you must take the time to explore, read, and reread the clues present in this house. And although discovering your family's location is the main objective, the more I dug into the house and its many unsettling pathways, the more I was sucked into the secrets buried even deeper. The microcosm of this household perfectly encapsulates the mid 90s. Anyone who lived through this decade will leave this game with an unforgettable sense of nostalgia. And not only is it great to see 1995 as a setting for a game that came out this year, but the fact that Gone Home is set in the 90's only supports your snooping objectives. You can't just pick up your cell phone and play phone tag to find your family; you have to actually take the time to look for them. What a concept! 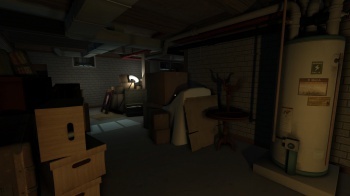 Gone Home takes The Escapist's Best Adventure of 2013 because it is just the right mix of uncanny and enigmatic to keep you desperately searching for every last scrap of information you can find in that huge, family home.